New Construction: New construction phased inspections generally include two or three visits, depending on your comfort level. The three visits are foundation, pre-drywall and final. Many buyers choose the last two inspections as many foundation concerns can be found during the pre-drywall inspection (although few concerns can be changed at this time – remedial alterations are generally available). If you have chosen a challenging lot or home design, the value of a separate foundation inspection will grow. The pre-drywall inspection is the visit your home will thank you for on its tenth and twentieth birthday and beyond. Here we will find if the framer assembled the structure properly, ensure other trades did not cut large holes through the framer’s good work and that electrical outlets are properly placed to name a few. The final inspection is the visit you will be thankful for as you move into your new home. We will ensure the Builder has properly connected and finished the multitude of items that are now concealed in your new home. We will exercise your home to ensure it performs properly down to the hot water being delivered from the “hot water side” (the left side as you face the faucet – now a Federal Law, not just common sense). The warranty inspection is primarily for new home buyers that missed their opportunity to inspect their new home before closing and for those whose first year of ownership has not lived up to expectations. Anytime during your warranty period you can schedule a complete home inspection. The process and report is the same as the final inspection. A warranty inspection is also recommended for new home buyers that have unresolved or on-going concerns. Re-sale: Re-sale home inspections are “snap shots” of the home on the day of the inspection. It is a complete visual inspection of the property from the exterior drainage to the attic framing. Around Atlanta, expansion and contraction plus moisture, mold and termites are the classic attacks on the re-sale home. We will exercise the electric, plumbing, heating and air systems to verify they are properly operating and if major maintenance or replacement issues are present. We will check the safety systems of the home – fire egress from bedrooms and smoke detectors plus opening the main electric panel to assess fire hazards. In owner-finished basements and additional spaces, ensuring positive combustion air for safe operation of gas appliances, proper headroom, HVAC and electric service are paramount. There are hundreds of individual items that will be assessed. Apartment and Multi-family inspections: Many local authorities require owners of apartments and multi-family properties to have a percentage of their units inspected each year to obtain their business license. I hold the Property Maintenance and Housing certificate required by these authorities to perform these inspections and recently completed this work in Roswell GA, Sandy Springs GA, Brookhaven GA and DeKalb County GA.
Home Maintenance: A home maintenance inspection is most important for any long term resident of their home. While Atlanta has been a service oriented city, the last decade has brought us closer to a “home town”. Ten years ago, the average time living in the same home was less than four years. Today, many of us are staying much longer and the life cycle of your home’s many systems comes into play. The difference between a re-sale home inspection and a home maintenance inspection is part of the discovery phase. You know if the hot and cold water in your master shower is backwards – I do not need to run $20 worth of utilities down the drain for this demonstration. We will concentrate on the life cycles of materials, the action Mother Nature is taking on your chimney, the effects of the drainage flowing from your downspouts on your basement and the like. A home maintenance inspection always receives a discount from the standard quoted according to the time saved during the discovery phase. Light Commercial and Investor: Light commercial and Investor inspections are performed with the same basic techniques and goals as a regular home inspection with your liability as a landlord taken into account. The property is always checked for plumbing, roofing, mechanical, electrical and assorted maintenance concerns plus fire safety and egress. This property is owned for-profit and not lived in as your home therefore we will assess if proper time and effort has been used to protect the investment. The inspection and report are geared more toward finances and cost than the regular home inspection. Specific Concerns: Examples of specific concern inspections are a foundation or basement drainage problem, a room or detached garage addition or a basement finishing project. 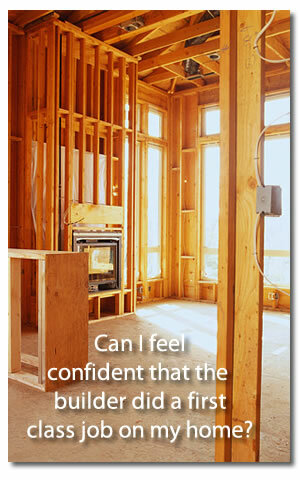 I have been asked to mediate between other Home Inspectors and Contractors. Fibrous siding and polybutylene plumbing have been large issues in the past. Moisture and mold are some of the up and coming concerns of today. These are often my least expensive inspections, call for your quote. Home Owners Associations: I perform multiple services for several associations. As an example, aging townhouse communities where everyone is not keeping up their end of the maintenance requirements are becoming a popular inspection. I document which houses are currently meeting your community’s standards and those that are not. The independent documentation allows the Association to enforce covenants, ensuring consistency of standards, without any home owner being the “bad guy”. I also perform “turn over” inspections for Associations that are taking over their community from the Builder/Developer. As an example, has the Builder/Developer taken proper care of the club house during the time it has taken to build-out the community? Are the water retention ponds safe and not easily accessible by children? I have defended my own Home Owners Association from another Inspector that claimed every deck in my community was built improperly. Home Owners Association inspections are always quoted on a case-by-case basis – please call for your quote. Radon Gas Testing: The Federal Government has determined North Georgia to be in the “Highest Radon Zone” in the United States. I will test your home for Radon Gas with two short term vials placed on the lowest living level in your home. These vials are not harmful in any way – they only absorb – the vials do not give off any emissions. The test must run for at least 48 hours (maximum test length is 96 hours). After this time, I will seal the vials and overnight them to the lab to determine the results. The lab will process and post your results in 24 to 48 hours after receiving the vials. Stucco Inspections: I will evaluate and test your “hard-coat” or synthetic stucco. This service is free of any additional charges as part of your Home Inspection. Stucco Only Inspections are quoted on a case-by-case basis. All tests are non-intrusive and no damage or destruction will come to the stucco during the inspection. I use an infrared camera to follow the path of moisture through your home’s cladding.